​The name of Polyphemus is probably not one that most people will recognise, even if they have some knowledge of Greek mythology; in his own way though, Polyphemus is amongst the most recognisable of all mythological figures, for he was the Cyclops encountered by Odysseus. Polyphemus of course appears in the Odyssey, as penned by Homer, and from this source we are told that Polyphemus is the son of the Olympian sea god Poseidon, and the Haliad nymph of Sicily, Thoosa. This parentage makes Polyphemus distinct from a first generation of Cyclopes, who were the sons of Gaia. Polyphemus was described as being gigantic in stature, and possessing only a single eye, just as the first generation had. ​In the time of the Trojan War, the Cyclopes were thoughts of as family groups found on the Island of the Cyclopes, an island that is generally considered to be Sicily. On the island, the Cyclopes wound tend to their flocks, and were therefore herdsmen, as opposed to farmers. The Cyclopes were considered to be barbaric and cannibalistic in nature, killing and eating the uninformed that landed on their land. The most powerful of all these second generation Cyclopes was Polyphemus, and so he was considered to be their leader. Famously, Polyphemus is encountered by Odysseus when the Greek hero makes his epic voyage home from Troy. It was early on the journey back to Ithaca, that Odysseus and a dozen of his men landed on the Island of the Cyclopes. All were promptly captured by Polyphemus and imprisoned within his cave home. Polyphemus rolled a massive stone across the entrance of his cave to prevent escape, and to keep his flock of sheep safe within. Then, one-by-one, the crew of Odysseus were devoured. ​Following the death of several of his men, Odysseus comes up with a plan for the rest to escape. 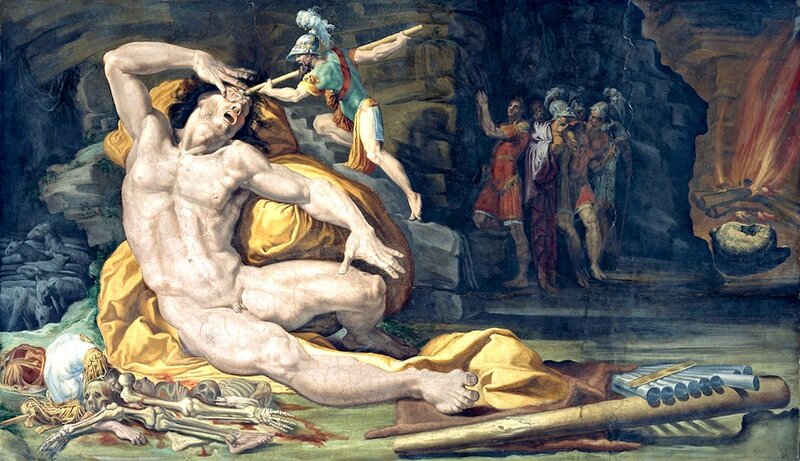 First, Odysseus gets Polyphemus drunk, then tells the Cyclopes that his name is actually “Nobody”, and then, when Polyphemus is in a drunken stupor, the giant is blinded with a sharpened log. Polyphemus may now be blind, but Odysseus and his men are still captive in a cave with the giant. 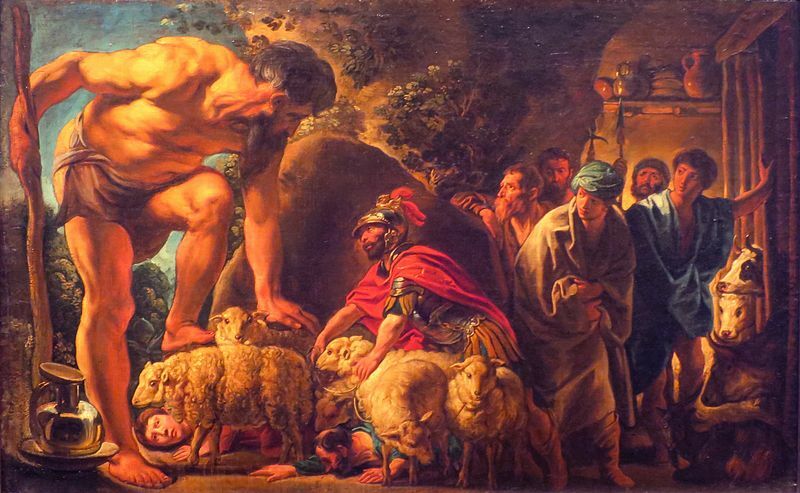 Odysseus though straps himself and his men to the underside of the sheep, and when Polyphemus rolls the boulder away to allow his flock to graze, the Greeks escape. Rather foolishly though, as the escape from the island was about to be completed, Odysseus reveals himself, by telling Polyphemus his name. The Cyclops then calls down the wrath of his father upon the Greek hero. This storyline of Polyphemus does continue after the departure of Odysseus, for Virgil in the Aeneid tells of the arrival of Aeneas upon the island of Polyphemus. The Trojan warrior rescues Achaemenides, one of Odysseus’ original crew who had been left behind. Slightly less famously, Polyphemus also appears in the musings of several other poets and writers, including Theocritus and Ovid, who tell of the love life of the Cyclops in a time before the arrival of Odysseus. 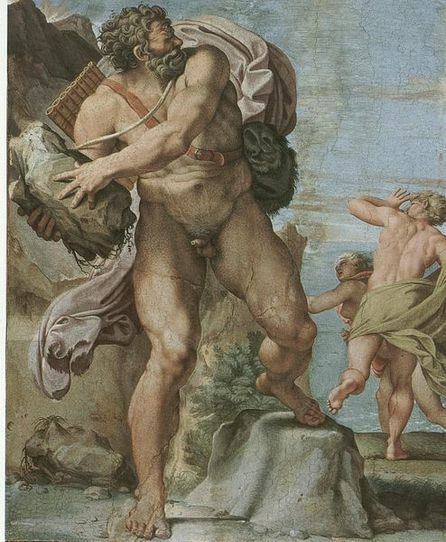 Theocritus would write sympathetically of Polyphemus, telling of the attempts of the giant to wed the Nereid Galatea, even going to great lengths to improve his appearance to woo the nymph. According to Theocritus, Polyphemus eventually gets over his love of Galatea, realising that there are others more easily seduced, and by ignoring her, Polyphemus ensures that the Nereid chases after him. Later, Ovid reverts Polyphemus back to a more barbaric giant, for when Galatea spurns Polyphemus is favour of the shepherd Acis, the Cyclops crushes his love rival beneath a gigantic boulder, and from the blood of a Acis comes forth the river Acis.